I need an ice cream intervention. Or maybe just a summer time intervention. Two things happened in the past 2 weeks. I ate ice cream almost every day and I gained 3.3 pounds. One day my friend who is moving away wanted to have ice cream from a certain shop she will miss when she moves, OK, I'm in! One day my aunt was here from Rhode Island, we went to lunch downtown and what better way to end lunch but with some ice cream. One night I went to dinner with friends and we walked to the gelato place after for dessert. One day we went to Smiling Hill Farm to check out the barnyard and stayed for lunch and of course their homemade ice cream after. Do you see the problem?? This was just last week, the week before was birthday week where I ate cake and ice cream almost daily. Make. It. Stop. The past two weeks are unusual. Yes, I love ice cream, but generally we are talking once or twice a week. July has been out of control and it is showing on the scale. Between my last two weigh ins I have gained a total of 5.2 pounds and I can feel it in my clothes. It is time to turn things around. I was saying to my sister in law the other day, that this week will be easy though, finally there isn't anything going on. She quickly reminded me that Friday is my birthday. Oh right! And I am going out of town for a concert. Ha! So my plan is this, I am tracking and exercising this week. Friday is my birthday and I won't track. Saturday, may not be good being away, but I will still track. Then Sunday through my next weigh in, I am following exactly, tracking and exercising. I will take off that 5.2 pounds as quickly as possible. Summer is hard for me. I drink more and I eat more. We are more social and eating and drinking goes along with that. In the fall my biggest problem will be apple crisp. In the winter we hibernate. We have the occasional social situation but nothing like summer. I don't expect to lose a ton of weight over the summer, but I don't want to gain. This is why I need an intervention! I knew this past weekend that I needed a WW meeting. I love the leader, she is so real and I always leave a meeting with a great tip. I don't always stay for the meeting because some days I don't have time, but this week I knew I needed it and you know what the tip was about this week, that stuck with me? Ice cream! She said she never denies herself ice cream, but when she goes she gets a kiddie size. She doesn't feel like that isn't enough because she knows that she will get another one another day because she never says, no. Now should I be eating a kiddie sized ice cream daily. Heck no. But in normal times (the last few weeks are an exception) we are maybe eating it twice in a week. Maybe. If I eat a kiddie sized ice cream each time rather than two scoops on a sugar cone, I bet I wouldn't see a big change on the scale and that is all I can ask for! The first 8 weeks I had consistent loss, with only one gain on the last week. This was great progress! In the last 8 weeks, I gained 3 times, with the last 2 weeks being the most significant. Overall, I am still down 13.8 pounds. I won't be weighing in this weekend because I will be away, but my goal for my next weigh in will be to lose the 3 pounds I put on last week. I tracked this weekend and I already feel lighter, so fingers crossed! Now I want to hear from you. Do you find summer to be a struggle? I feel like sometimes I hear that people are more active in the summer so they feel that winter is more of a struggle. If you are on your own journey how is summer treating you?? Wednesday, I am going to talk about a super fun thing I did with the kiddos to taste test some fruit! If you have picky kids or not, you should come back and check it out! When I did WW YEARS ago, I kept all my cards, too. Even the weeks I gained, it was fun to look back and see how far I'd come. I normally eat more in the winter and get less exercise, so that's when my weight jumps the most. Just think of this as a minor set back and enjoy your summer! I feel like anytime is a struggle for me to lose weight. Any kind of family function or party is hard too. I've been working on it since May, and I have lost weight, but it has not been easy. Sending you my virtual support. Thank you!! Yay for you on losing weight! I hear you for sure.... I do a YouTube video every day and through my videos (although one is called 'Summer Challenges') there is the theme of how the summer is the toughest of seasons. I'm on the Cape and it's the same. So many seasonal places that sell the ice cream. I think telling on yourself is good. Integrity. The slipping and sliding is tough. There is only one way, for me, to kill that daily 'treat'. That is to stop. Go without. I know for me, if I have a 'treat' two days in a row the set-up happens. The flame is lit, the monster is out, the 'wanting' will not be denied. Sounds like you are in it with lots of happenings, still, coming up. I hope you are able to tighten your tracking and say 'no'. I have one 'treat' a week (from a farmer's market that will close in Sept) and I salivate all week. The rest of the week I know, for me, I have to say 'no'. Having a food sponsor helps. I started following you on Google+, looking forward to checking out your videos. It is true that once you do more than one day of a treat it snowballs! I have tracked everything and had a great day yesterday! Thanks for commenting! You can do this! :) It's mind over matter! I lost over 100 pounds (no program followed... just exercised every day and ate healthy). I know it's hard. 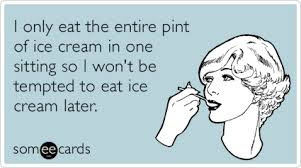 And ice cream in the summer is tempting. But every time you want ice cream, think of how you feel when you step on the scale and the number goes UP. Losing weight is HARD. HARD, HARD, HARD. But you can do this. Chin up and keep going!